This solo task is the final task in a series of six. 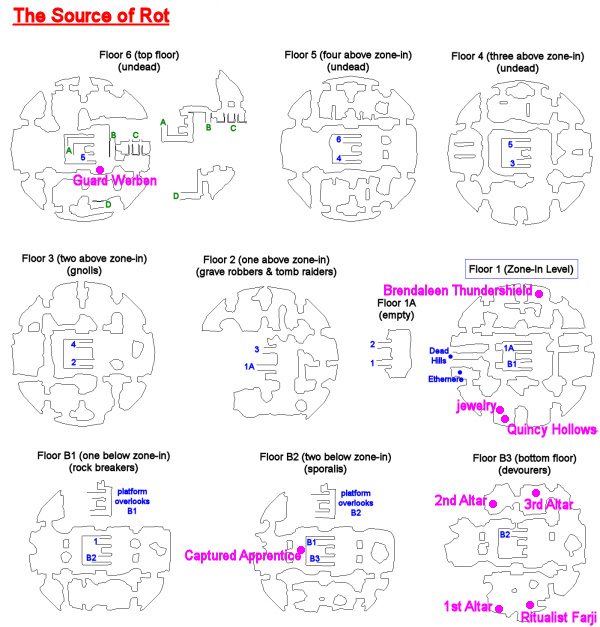 It begins with Dedire Harath (click for map image) on the zone-in level of the Tower of Rot. - Completed "The Scions of the Tower"
- Completed "The Tower's Victims"
- Completed "The Adana Problem"
Say "open it" to request the task. - Hail "a captured apprentice" (two floors below zone-in). - Location update in the southern room of the basement to spawn Ritualist Farji. - Kill Ritualist Farji, and loot the "Raw Mana Flask" from his corpse (drops one per kill). - Hail Guard Werben (top floor). - Kill "a cowering apprentice" until you've looted 8x "Magelock Fragment". - Use the jewelry table next to him to craft a "Magelock Stone" (combine the flask + 8 fragments). - DPS ghost mobs to under 20% health and click the stone on them (repeat x10 to get "Empowered Magelock Stone"). - Head to the bottom floor and use the Magelock Stone on an altar to make it damageable, then kill it. --- 1-2x "a defender of rot" (200k hp; AEs a 27k nuke) every 20 seconds while the altar is engaged. --- Do this for each of the three altars in the basement. - Hail Deidre to complete. You have been assigned the task 'The Source of Rot'. Narius has sealed himself within the source of rot, and Deidre needs you to find a way inside. Task Window Says: One of Brendaleen's scouts has caught a Scion apprentice that has knowledge of the magic used to seal the source of rot. Speak with Brendaleen. Task Window Says: To learn more about the sealing ritual, speak with the ritualist apprentice that was captured and is being held on the second floor of the basement. Find "a captured apprentice" at /loc -5, 65, -397, and hail her. Task Window Says: You must find Ritualist Farji near the entrance to source of rot, on the lowest level of the basement. Confront him and take the Raw Mana Flask from him by any means. You sense the presence of Ritualist Farji. Ritualist Farji prepares to expel a mana pulse. Ritualist Farji expels a mana pulse. Kill him and loot "Raw Mana Flask" from his corpse. Task Window Says: Now that you have learned more about the seal and the Magelock Stone, speak with Brendaleen and see what she thinks. Task Window Says: Guard Werben has been following the apprentices that might be carrying fragments of the Magelock Stone. Speak to Werben on the highest floor of the tower. Guard Werben is found on the top floor at /loc -55, -30, 503. Task Window Says: The apprentices are trying to gain access to Kyle Bayle's sanctum. Kill the cowering apprentices and retrieve the Magelock Fragments from them. Kill "a cowering apprentice" mobs on the top floor of the tower until you've looted 8x "Magelock Fragment". As far as DPS goes, these mobs are average difficulty (mezzable; hit for a max ~17,500). It's been reported they may be highly resistant to magic-based spells. Task Window Says: Quincy Hollows might know how to repair the Magelock Stone. Speak with him. Quincy Hollows looks over the fragments of stone and the mana flask. 'I'm not an expert on magical stones, but I'd say you would need a jeweler's skill to repair such an intricate object. Perhaps combining the mana flask with the fragments would help fuse the stone together? Task Window Says: Quincy thinks you can repair the Magelock Stone using a jewel crafting table, the Magelock Fragments, and the Raw Mana Flask. There is a jewelry crafting table near Quincy Hollows (/loc -135, 50, 4). In it, combine 8x "Magelock Fragment" + 1x "Raw Mana Flask" to produce 1x "Magelock Stone". Quincy Hollows holds the repaired Magelock Stone and frowns. 'It still looks... dead. I think it needs some sort of power. I've traded a few trinkets like this before, and the sellers -- always frightening, threatening-looking folks -- told me such objects could be powered by souls and spirits. There are plenty of ghosts at the top of the tower, right? Perhaps they could bring life back to the stone! Task Window Says: You need to charge the Magelock Stone in order to use it. Quincy thinks you should weaken the ghosts in the tower and use the stone to absorb their spirits. DPS ghost mobs to low health (under 20%) and right-click the Magelock Stone (this is an instant kill of the mob). Repeat until this step updates and you receive "Empowered Magelock Stone". Note that if you're doing this as a group, a single click will update your entire group. a pine protector's spirit is captured in the Magelock Stone. a pine protector's energy is absorbed into the Magelock. a pine protector's corpse is silent and still. You have successfully powered the Magelock Stone! You receive "Empowered Magelock Stone" on your cursor. Task Window Says: Now that the Magelock Stone has been charged, use it to make the altars of rot vulnerable and destroy them. third altar of rot's defenses are weakened by the Magelock. Third altar of rot's defenses are destroyed. third altar of rot regains its defenses. You have successfully destroyed the magical barrier that sealed the source of rot. You can now prepare to confront Narius. 3 minutes. Tower scions in room seem to be about 8 minutes. Tough fight. Plus each toon working this quest has to loot the drop, which always drops as a single, so if all 6 in the group are working on this task you'll have to kill this mob 6x. Even getting TO his room is challenging. There are 2-3 see-all-invis sperm en route. You can fight your way, but expect constant adds. I used a rogue to scout and ran a mage to safe spots to CoH the group. But no spot is really safe since the sperms wander. The room itself has a corner which is just barely out of agro range of the 2 scions with static spawn spots in the room. There are two wandering scions who pass thru the room and they'll get close enough to agro onto anyone uninvis'd in that corner. We were able to plant a campfire there and if done with care a mage can /campfire into the spot and, timing it carefully, CoH the group to this spot. You then have to clear the 4 scions to have some working room to fight Farji. The commenter below is correct, there is no trigger dialogue with Farji. He spawns if anyone needing his drop enters the room. He won't agro until a player is very close to him. It doesn't matter if the player needing the drop is close to him, or gets the agro. Once he spawns for a player, he's "in play" and his drop can be looted by anyone in need. He's a fairly tough fight, with a lot of HPs and aoe nuke spells that hurt. I suggest burning him down so you might just have enough time to fight him a second time before you have to deal with the scions re-popping. Once Farji dies, he comes back in a couple of minutes. You'll see warning text that he's no longer in the area but coming back soon. A group of 6 will have to deal with the 4 scions at least once and probably twice. Makes for a long stretch of almost constant fighting. Each player has to loot 8 and they drop one per kill every time so a full group has to slay 48 of these mobs. The good news is there are a lot of spawns and they repop in 2.5 minutes. The bad news is they lurk in packs of 2 or 3, assist each other and are close to other undead mobs that assist them. There is one good camp, though. 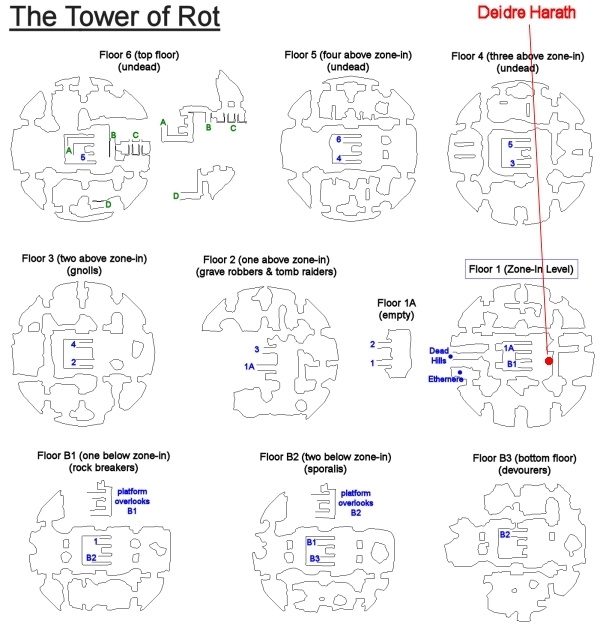 If you run around Tower of Rot for a time you learn that between the up and down ramps there's a little room that goes nowhere. On the top floor that room has a 2-spawn of the apprentices. This is a good camp to hold, due to the fast respawn timers, and you can get your drops pretty quick. There is one undead wanderer who might add unless you keep the fight very close to the back wall. Suggest doing the 2nd and 3rd first since they're much easier to get to (they're close together), requiring only clearing a couple of see-all-invis sperms. With 105 spells, the best approach is to burn them down and ignore the adds. The adds will keep popping even after the altar is destroyed, so be ready for that. If you burn the altar REALLY fast, you can handle all the adds sequentially as they pop afterwards. They have very few HPs but they cannot be mezzed. The 1st is a beeyutch to get to and then to set up for the fight. Group has to get past 2 sperms, get tight into the corner near the altar and then clear at least 4 scions to avoid adds during the engagement. A worthy challenge to complete all the Tower of Rot's partisan tasks! Im not sure if something changed but the Fujari part of this post is totally not accurate. I spawned him and he agroed immediately no dialogue. Either he spawned adds or he pulled mobs from the adjacent rooms, in less than 30 seconds I had at least 4 scions in the room with me, needless to say it was over pretty quick lol. I did clear in and everything, the adds were not respawns. Normally, one would think so. But the truth here is that the mobs respawn very fast in this area. I didn't time them, but as an experienced puller I'd say around 7 minutes between repops. We got overwhelmed there a few times too, at one time I had 4 mezzed and we were killing Farji... killed him and started on the adds (which had spawned one more in the meantime) and about a minute later Farji popped again and attacked, since some of the group still were at that step. It got messy. To top it off, you MUST kill and loot Farji in the busy room where he spawns, or you won't get task credit for it. I found this out by clearing half-way to him, then spawning and pulling him to the "stairs" several times for a group. No one got credit when they looted him outside his room, so we had to clear fast and kill him there, which worked. They were more resistant than run of the mill mobs though. Work on ANY ghost, not only a pine protector. It work too on female ghost coercer, so i think it work on any ghost too. The cowering apprentices are a bit special - anything magic based will NOT land on them. Tash will as it's poison based, but even after that, malos won't land nor will anything else based on magic. Thus they can't be mezzed, chanter slowed, most stuns, etc. They do not flag as technically magic immune so maybe at some point we'll be able to land magic on them when the level limit increases etc. Actually, malosinette landed fine, and once that landed, other magic based spells landed fine, including magic based slow. Monk mez worked on them just fine for pulling too.